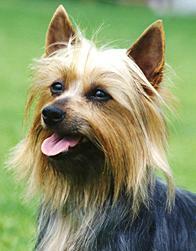 The Australian Silky Terrier is often said to be the result of a planned mating between an Australian Terrier and a Yorkshire Terrier, but because stud records were not kept in the early days this cannot be proved. In 1900 the Australian Terrier Club was formed, but folded a couple of years later leading to the formation of the Victoria Silky and Yorkshire Terrier Club. In 1904 this new club drew up a standard for the breed. Soon after breeders in Sydney formed the Sydney Silky Club and developed a separate standard for what was to be known as the Sydney Silky. 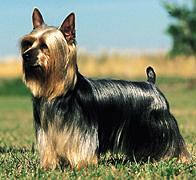 Even today, Australian Silky Terrier breeders will receive requests for Sydney Silkies from throughout the world. And it was not until 1959 that the Silky was recognised as being a breed and was given the name Australian Silky Terrier and the official breed standard drawn up. Silky Terriers have a feisty appetite for life and usually live up to 13 years of age, but some extra care and sound diet can easily live up to 15 years of age. The Australian Silky Terrier is friendly to all the family, but will usually attach itself to one member and be friendly with the rest. It will tolerate strangers, but no more than that. It will love children if raised with them, but it doesn't enjoy being fussed over or being treated like an animated toy and prefers to be treated as an equal. The Silky is classified as a toy dog because of its size, but it is far removed from the usual lap dog. It has the true smart and forceful character of a terrier and it has all the advantages of a small dog in suburban life, not being too big for the children, the car or the garden. Bred as a house dog, it is just as much at home in the country protecting the homestead from snakes and rats with all the tenacity and zest of its terrier forebears. The Silky is a mixture of temperament traits, taking after the Australians who bred it. Needs to be introduced to other pets at an early age. Remember this is a terrier breed. Similar to most long-coated dogs, the Silky loves being groomed, provided this procedure is started at an early age. The amount of grooming required is dependent on the actual length of coat your Silky has inherited. A Silky does not require a great deal of exercise, but being full of tremendous energy, it will love running in the fields or going for long walks on the end of a lead. Its bed is its kingdom, be it a cardboard box or a fancy basket. All small dogs should be allowed to sleep inside, so set the bed in a place that will be suitable to you and your Silky. The Silky is not suited to being an outdoor dog. Those who want a family companion, and are willing to have a dog living indoors.